A gorgeous rental villa stand on the cape Yamu. Cape Yamu there is a quiet with a wealth of nature surrounding. Boasting over 4,000spm of indoor and outdoor space has perfectly maincured tropical gardens and ocean view. 1~8 Bedroom suitable for all kind of guests such as Couple, Family and group. Villa Sawarin, the property is allowing guests to walk up the 2 km beach and enjoy with a view of Phang Nga Bay and the sunrise. 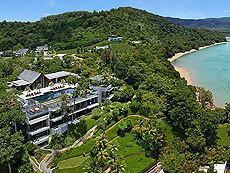 Phuket Airport Resort & Spa ! !